And if so, is that terrible news? A few weeks ago, Time magazine called the fight over the Keystone XL pipeline that will bring some of the dirtiest energy on the planet from Alberta, Canada, to the US Gulf Coast the “Selma and Stonewall” of the climate movement. It was certainly joyful to see marriage equality being considered by our top judicial body. In some ways, however, the most depressing spectacle of the week was watching Democratic leaders decide that, in 2013, it was finally safe to proclaim gay people actual human beings. In one weekend, Democratic senators Mark Warner of Virginia, Claire McCaskill of Missouri, Tim Johnson of South Dakota and Jay Rockefeller of West Virginia figured out that they had “evolved” on the issue. And Bill Clinton, the greatest weathervane who ever lived, finally decided that the Defense of Marriage Act he had signed into law, boasted about in ads on Christian radio and urged candidate John Kerry to defend as constitutional in 2004, was, you know, wrong. He, too, had “evolved,” once the polls made it clear that such an evolution was a safe bet. Let’s begin by stipulating that, taken as a whole, they’re better than the Republicans. About a year ago, in his initial campaign ad of the general election, Mitt Romney declared that his first act in office would be to approve Keystone and that, if necessary, he would “build it myself.” (A charming image, it must be said). Every Republican in the Senate voted on a nonbinding resolution to approve the pipeline—every single one. In other words, their unity in subservience to the fossil fuel industry is complete, and almost compelling. At the least, you know exactly what you’re getting from them. Which actually may have been generous to the president. It’s not at all clear that he wants to stop the Keystone pipeline (though he has the power to do so himself, no matter what the Senate may want), or for that matter do anything else very difficult when it comes to climate change. His new Secretary of State, John Kerry, issued a preliminary environmental impact statement on the pipeline so fraught with errors that it took scientists and policy wonks about twenty minutes to shred its math. 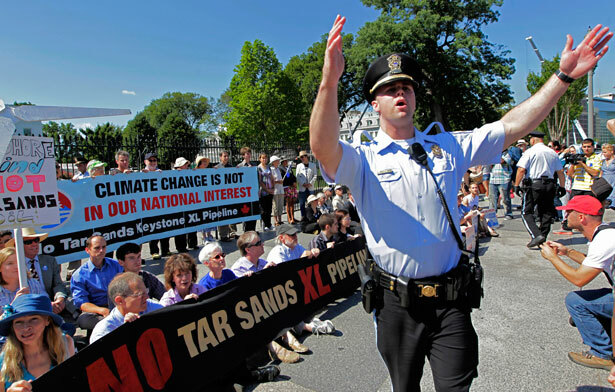 Administration insiders keep insisting, ominously enough, that the president doesn’t think Keystone is a very big deal. Indeed, despite his amped-up post-election rhetoric on climate change, he continues to insist on an “all-of-the-above” energy policy which, as renowned climate scientist James Hansen pointed out in his valedictory shortly before retiring from NASA last week, simply can’t be squared with basic climate-change math. All these men and women have excuses for their climate conservatism. To name just two: the oil industry has endless resources, and they’re scared about reelection losses. Such excuses are perfectly realistic and pragmatic, as far as they go: if you can’t get re-elected, you can’t do even marginal good and you certainly can’t block right-wing craziness. But they also hide a deep affection for oil industry money, which turns out to be an even better predictor of voting records than party affiliation. Instead, at best they insist on fiddling around the edges, while the planet prepares to burn. The newly formed Organizing for Action, for instance—an effort to turn Barack Obama’s fundraising list into a kind of quasi-official MoveOn.org—has taken up climate change as one of its goals. Instead of joining with the actual movement around the Keystone pipeline or turning to other central organizing issues, however, it evidently plans to devote more energy to house parties to put solar panels on people’s roofs. That’s great, but there’s no way such a “movement” will profoundly alter the trajectory of climate math, a task that instead requires deep structural reform of exactly the kind that makes the administration and Congressional “moderates” nervous. And indeed we should, but climate-change science makes it clear that we need to put the same sort of thought and creative energy into killing oil and natural gas, too. I mean, the Arctic—from Greenland to its seas—essentially melted last summer in a way never before seen. The frozen Arctic is like a large physical feature. It’s as if you woke up one morning and your left arm was missing. You’d panic. Along with some way to make a third party truly viable, we need a genuine movement for fundamental governmental reform—not just a change in the Senate’s filibuster rules, but publicly funded elections, an end to the idea that corporations are citizens and genuine constraints on revolving-door lobbyists. These are crucial matters, and it is wonderful to see broad new campaigns underway around them. It’s entirely possible that there’s no way to do what needs doing about climate change in this country without them. But even their most optimistic proponents talk in terms of several election cycles, when the scientists tell us that we have no hope of holding the rise in the planetary temperature below two degrees unless global emissions peak by 2015. The reaction to now-former Rutgers basketball coach Mike Rice's homophobic comments speaks progress for queer justice. Read Dave Zirin's take.